Now that I am a mom and it’s been over three years since I wore anything in my closet, I find a lot of it isn’t me anymore. My style has changed with age and motherhood as well as the trends on the high street. I have been looking through it trying to revamp my style, use what I have but also see what I need to invest in next. My flared jeans can be put on eBay immediately, I can count those out for sure. My tight, short body-con dresses, yes, you can go to, I won’t miss you. Then there are the clothes I stretched, ruined, and wore to death while I was pregnant thinking I didn’t need maternity clothes. I could squeeze into what I already owned because it was only for nine months – twice. Not a good choice. Fine while I was pregnant, not so fine when I went to wear my favorite tunic and I realized the imprint of my pregnant belly was permanent. So I am on a mission to find my new mommy style. One that is still trendy and fabulous but practical and affordable. A little less heels and a lot more flats. (don’t worry I only said a little less heels). – Slouchy Boyfriend Blazer from Warehouse. I think blazers are a great yummy mummy look. I can throw them over dresses, sweaters, tank-tops and blouses. This blue is electric and will go with so many other colors. 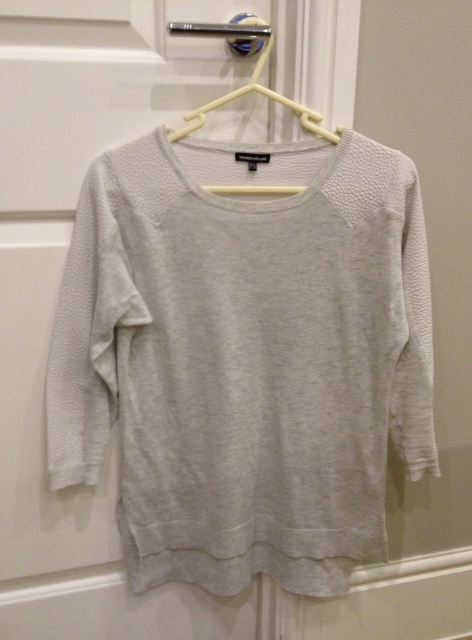 -Cream Knitted Jumper from H&M for only £14.99 I love a good knitted sweater. Especially for weekend wear when you want to chill out with the family. – Flats from Next with bling. Even though I may be wearing more flats these days as I pack that heavy carseat around while balancing my toddler and diapers bags, doesn’t mean they can’t be just as loud and glittery as my heels used to be. 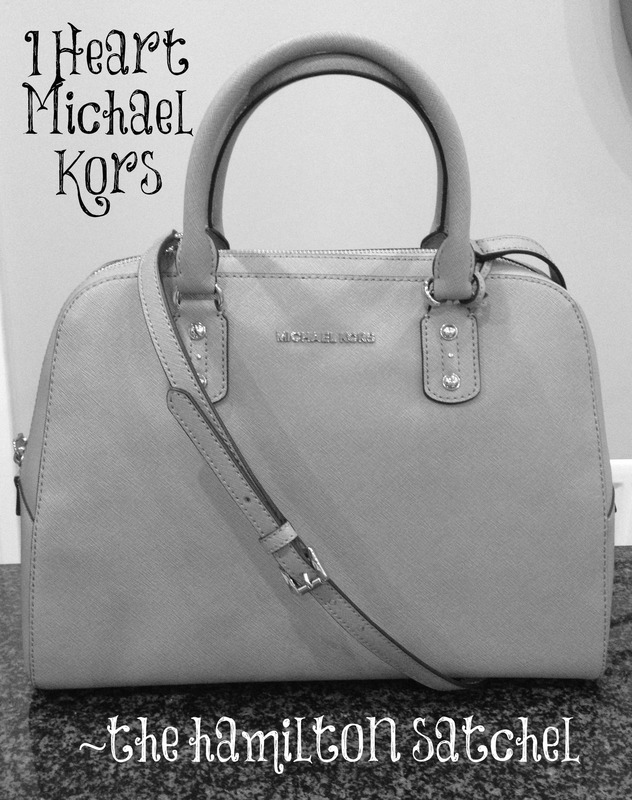 – Michael Kors handbag in light grey. I love anything grey. This one was actually one I used my birthday money on because it was a more expensive item but I got it in the sales at Cheshire Oaks on Boxing Day so it was a HUGE bargain. ( I wouldn’t spend full price for a handbag – has to be a bargain). – Lily White Slit Maxi Skirt from Nordstroms, it was only £5.50. I wore it almost my entire vacation in Lanzarote. Perfect for putting over my swimsuit. I also wear it with sweaters and knee high boots. It’s so versatile and comfortable. -Pointelle Yoke Mid Sleeve Jumper from Warehouse. Although I grabbed it in the sale at the Warehouse Outlet Store for £10 instead of the £38 it is in the shop. 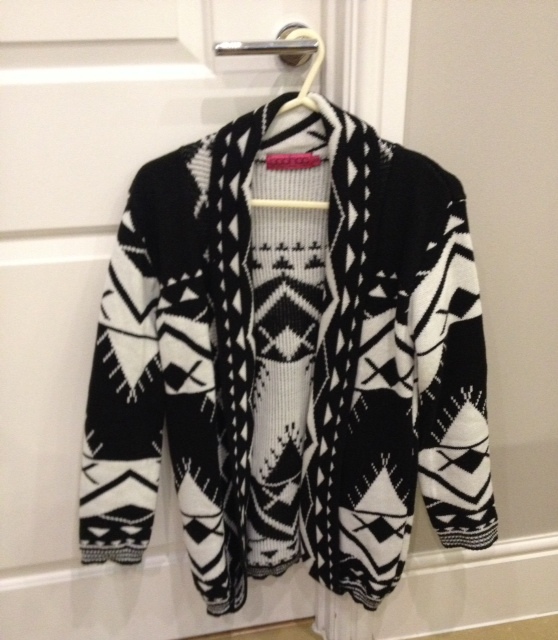 -Carly Aztec Cardigan Black & White from Boohoo.com I was lucky enough that Mr P won a gift certificate for £100 at boohoo.com for a benefit he went to. This was one of the many items I selected. It’s so warm and cozy for these chilly days upon us. 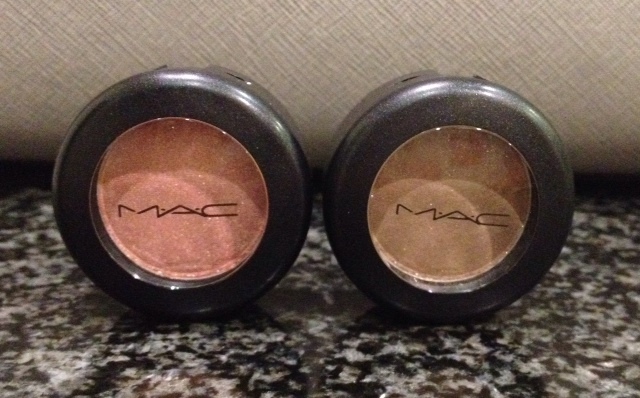 -MAC eye shadow. I found myself at the counters of MAC looking through all their pastel colors attempting to find one I could wear everyday for a casual mommy look. I came home with Gleam and Honesty, they are great colors I can mix with darker ones for a night look. I am hoping that throughout the year, I can evolve into my new look with ease on the pocket book and come out with a style that still both fabulous and practical. Has your style changed since becoming a mom? Have you turned a milestone age, like me, 30 and think you can’t pull off a certain style anymore? I would love to hear your comments below. Thank you that’s so very kind of you to say. Yes do I am in love with the eye shadow already! I don’t know much about style I once got told my style was very GAPish even though I don’t own anything from the gap. Lol Not that I wouldn’t because I buy my kids gap all the time but adult clothes are very wide fitted and tall for my short stumpiness. The biggest thing I have noticed with shopping after becoming a mommy is that many items seem too revealing. I have had a hard time striking a balance between keeping it age appropriate but still modest enough to be appropriately mommy. It seems as though everything I find is either too young (early 20s), or too matronly.